I was invited to visit the Gypsy 05 headquarters recently and loved the idea of seeing a fashion label up close and personal, so I jumped at the chance the check it out. I was introduced to the brand during Bloggers' Cafe and the Grammy Style Studio, but was interested in learning more. Bianca, the marketing rep, was generous enough to show me around and gave me an informative tour of their extremely colorful (and well-decorated!) offices. Everything for Gypsy 05 (and I mean everything, from start to finish) is done in the heart of Los Angeles--designing, dyeing, printing, manufacturing, shipping, and anything in between! It was fascinating to learn about the entire process. They mix the dyes by hand and use specialized dye processes to color the textiles, all of which is done on-site. There are even special tumblers outside for adding stonewashing finishes. I met briefly with the head designer and CEO, siblings Osi and Dotan Shoham. Dotan was friendly and talked openly about how Gypsy 05 strives to be as eco-friendly as possible. Not only do they use natural dyes and recycle, the entire place runs on solar power! There aren't many manufacturers in LA--or anywhere else for that matter--that can say that. It's hard to believe that every single one of the garments starts out white. 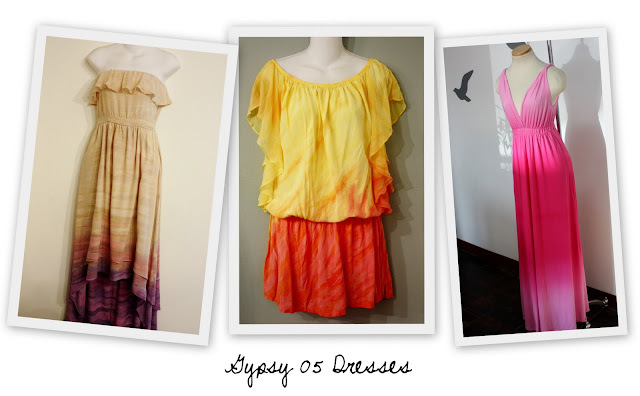 Gypsy 05's signature ombre dyeing and unexpected color combinations, as well as luxurious and flattering silhouettes, has made them popular among celebrities, bloggers, and fashionistas alike! I'm extremely excited to see what designs they'll come up with in the future.